I thought I would start a thread on my latest project which is a Venturi 200 That I bought last week at auction having not seen the car at all, what could go wrong!!! It looked ok in the photos!! Once it arrived I had a good look over it to find it had really been "GOT AT" and there were bits hanging off and stuff not connect but i hooked a battery up to it anyway to see if anything would work. The dash lights came on and the seats moved but that was about it. On further in inspection the fuel pump was hanging down under the car and the outriggers on both sides of the chassis looked pretty rotten + all the suspension was rusty. I then decided the only way forward was a full rebuild. So I took most of the interior out and dropped the powertrain out of it. Then I stripped down the sub-frame that carries the suspension and engine and gearbox. At this point i checked to see if the engine had any compression. This didn't go so well with only 1 cylinder with 7bar and the rest somewhere between 1 and 6 bar!!! That brings us upto date the next job is to finish taking the suspension apart and drop it to the sand blasters then to take the front end apart. I could do with some help though in finding some parts, I need to know where all the suspension bush's and ball joints come from as they all need replacing. I have been in contact with someone who is trying to find out but any other help would be appreciated. The next thing is the engine, everything is really corroded to a point where you cant even make out the manifold nuts!! It obviously needs a full rebuild and more more power. I read about someone using the 2.5 bottom end with 3lt ported heads and 610 cams with a bigger turbo making really good power I think this might be the way to go. Wow you don't hang around! I'm sure PaulC will be able to point you in the right direction on bushes. Clee should be able to source the engine bits for you. Trying to locate that info honest! But I have put Ian in touch with the UK godfather of Venturi, Philippe Bachelet up in Edinburgh who has contacts in France and will get info or parts if required. Wow, what a lot of work in a short time, to be honest I'm glad you won it , not me, I have too many projects like that just now and it would have sat under cover for a long time if I had made a more serious bid. You'll need to talk engine options with Martin Faulks, the father of the high capacity 3.0l heads on the 2.5 litre engine activity. Best wishes with the rebuild, I'm sure it will be worth it in the end. If the compression is that low and it's corroded on the outside you might find the internals are similar - it's happened before with supposedly good engines being left sans plugs. Bores / liners get corroded and then the compression is shot. With that in mind you might be better off finding a full 3 litre low comp n/a engine and then adding the turbo? You'd need certain bits and bobs (rare and expensive injection manifold) but I think some ancillary wotnots could come from the 2.5. There's some detail differences (sodium filled valves I think) but it's doable and there are a few threads on here discussing it. It certainly sounds like you're well underway. Good lad, this will be a good project to follow, like your style bud not hanging around! Just a quick update. Car is now down to a bare shell with all the suspension striped ready for painting then new bushes / bearings and joints to be fitted. I have also got hold of a Safrane 3L engine Z7X 722 does anyone know if there are any major problems to over come with putting this into the car? I would personally try to keep with the originality and keep it 2.5 V6 Turbo as intended. Not only that surely it's a lot more of a faff to put a completely different lump in? A 3l Safrane engine will probably only be 170 HP (it's the wrong engine type for the safrane bi turbo block) and normally aspirated. I haven't looked up the engine number, but z7x is quite different in details to the z7U block the car had originally, many of the ancillaries won't fit. That's possibly quite a bit of work as you won't be able to turbocharge that block without lowering the compression ratio. That means changes to induction and fuelling systems, exhaust etc. Unless you have reasons for wanting to make it slower and less original, I think you'd be better off getting your original engine fixed by one of the specialists. What you are proposing could be quite a lot of work. Unfortunately a blended engine (best bits of each) will be quite a bit of work too. Last edited by mettersl on Tue Sep 16, 2014 6:35 pm, edited 1 time in total. 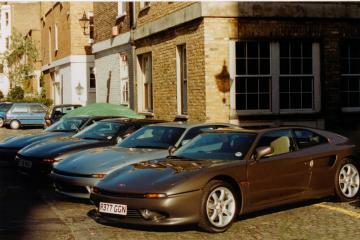 BIG_MVS wrote: I would personally try to keep with the originality and keep it 2.5 V6 Turbo as intended. Not only that surely it's a lot more of a faff to put a completely different lump in? Yes to the previous three posts. Ian if you have always wanted a Venturi then have a Venturi, don't make a Bitsa. Keep it as original as you possibly can, if you can't rescue the original engine then use a 2.5 litre GTA Turbo engine, it is the very same engine that is in your Venturi 200 and can be sourced through the forum and Clee or M Faulks. The Safrane engine might seem like a good idea but it is not original to the model and if you are thinking of the twin turbo in the Atlantique 300 then forget that as it took Venturi millions of Euros to develop and it still didn't work properly. Sorry to rant fella but that's my twopenneth worth. Keep up the work though you seem to be progressing quite nicely. My plan was to build the 2.5 and 3L engines into one engine so it will still be turbo charged. I see the dizzy is on the otherside to the original engine I don't think that should cause a problem I also need a A/C pump which uses R134a and not R12 which this should have. Does anyone have any details on Cam profiles of the two engines or any other major problems i may incounter? It should bolt up to the UN1 gearbox, the engine mounts are in the same place I presume. As for the compression ratio I will either machine the pistons to reduce it or leave it at it is which is only 9.6:1 and i should be able to run something like 8 - 10psi. When the car is finished i want it to look original but be usable as it is going to be my daily driver. It wont be a bitsa its only the engine that will be different and if dne correctly should maintain its value. The prices i have been quoted a old GTA engine were very high to a point were i was about to just bite the bullet and put in a Audi RS4 B5 engine 6spd box. Fair enough Ian, it is after all your project. Saf lump may not be the bargain it seems ,head spacing etc and if you are in to taking the heads off then you'll soon eat up the price I quoted .